Within the past 2 weeks, Adobe has released 2 updates for Bridge CS5. Now at version 4.0.2.1, I am happy to report that the Export Panel has been fixed. Yeah!! The Export Panel really can be a timesaver for batch processing. 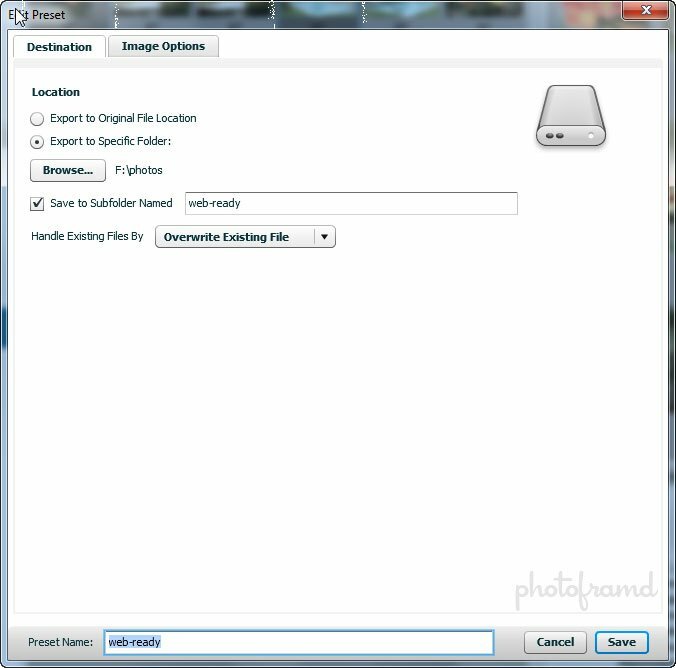 Just select a series of files within Bridge CS5 and drag-and-drop them onto the Preset. That’s it! The Export Panel comes with the ability to upload files directly to your accounts on Facebook, Flickr and Photoshop.com, but it’s the Save to Hard Drive which will really speed your workflow. With the Save to Hard Drive Preset highlighted, just click the + in the lower right corner of the Export Panel. The above screen will open which will let you specify the output location and the name of the new Preset. In the Image Options tab, you can set the maximum pixel size for the longest side of the image. (It will apply this maximum to either the Height or the Width, depending which is longer.) 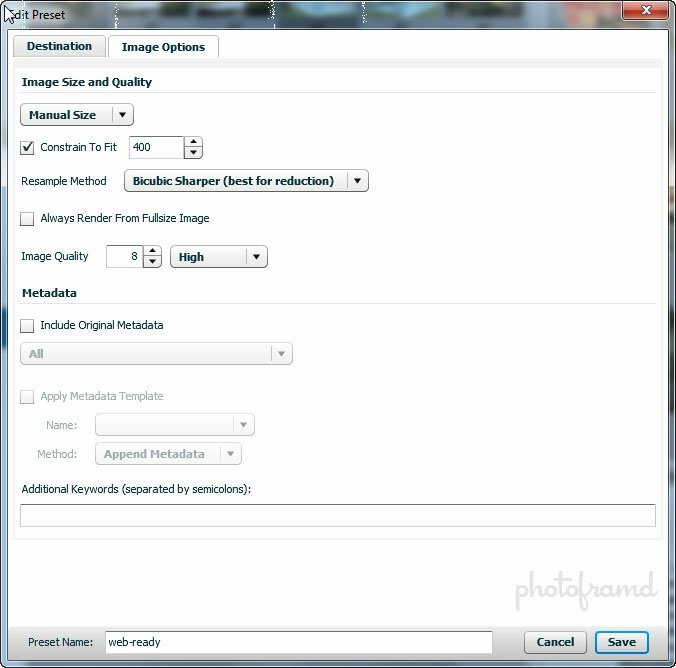 You can set the Resample Method just like in Photoshop and specify to include the Metadata. 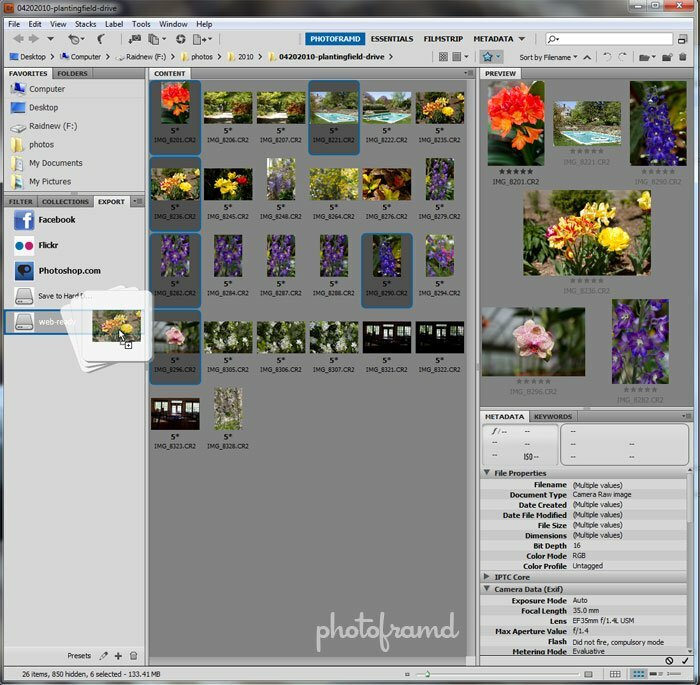 (The Save for Web function in Photoshop strips Metadata to reduce the file size.). Then, just Save the new Preset. With the Preset in place, you can then select multiple files in Bridge and drag-and-drop them onto the Preset. Bridge will then build a Queue to process the images while you continue to work. Adobe, I would love to see a Print Function added to the Export Panel. You would make a lot of people VERY HAPPY! The save to hard drive is great for the workflow. But the Image Quality defaults to 8 and can not be changed even after it is saved. Maybe you have found a trick? Sounds like it might be another bug. Are you creating a new Preset? That should save all settings to that Preset. Yes, I’m creating a new preset. This is the only settng that is not getting saved. I am using Bridge CS5 updated to 4.0.3.9. If you set the image quality through the drop-down for Maximize, High, Medium, Low and save it, the setting will really be “saved”. However, if you do use the numbers to adjust to a specific setting, that will last only until Bridge is closed. You are right … it does sound like a bug. Save to hard drive option does not show in my export panel what should I do? Just saw this myself. Something must have happened in a recent update. But, it can be fixed! In the Export Tab, click the drop-down for Manage Modules. In this tab, click “Reinstall Modules”. You will then need to close Bridge completely and open it again. The Save to Hard Drive will now appear.